Myanmar election: The commander of the country’s powerful military discusses Aung San Suu Kyi. 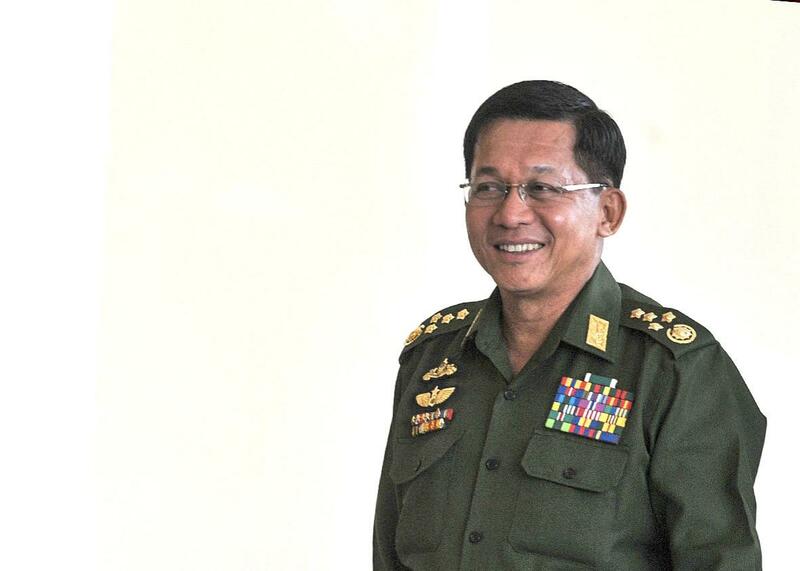 An interview with Myanmar Gen. Min Aung Hlaing. Gen. Min Aung Hlaing in Naypyidaw, Myanmar, on April 10, 2015. When will you meet with Aung San Suu Kyi to discuss the transfer of power? This coming December. When the electoral process is finished, we will meet. Are you willing to change Article 59F of your country’s constitution to allow Aung San Suu Kyi to become president after her tremendous victory? I can’t decide this alone. Under Chapter 12, the parliament must discuss any amendment to the constitution. I am not directly responsible for that. But would you favor that change? Twenty-five percent of the seats in the parliament are reserved for the military. Considering that she had such a huge victory, don’t you think it would be fair for Aung San Suu Kyi to become president? Our law is not [enacted] for a single person. Amendments must be done according to procedures. So you’re basically saying no, you won’t let her become president? I didn’t say no—this is according to the law. Don’t you have to work with Aung San Suu Kyi to make this country function? The important thing is the long-term national interest of our country. Do you think you can work with her? If we have good results for our country, we can work together. There are so many ways to cooperate. Will it be difficult for you and Aung San Suu Kyi to compromise? If we have good results, things can be negotiated. Do you feel that more power should go to the civilian authority over time? If the country’s situation is stable, one day we will do what you are talking about. So if the country is stable, you will be willing to cede more power to the civilian government? What are the signposts of stability to you? No. 1 is the ethnic armed conflict—we need real and total peace in our country. No. 2 is the maturing of the multiparty democracy system. Third, we need better relations between the ethnics and the government. Only eight ethnic groups signed the cease-fire agreement with the government. Now you need the rest of the groups to sign on? Yes. The other groups need to be brought into the cease-fire. What do you think about the criticism of Myanmar’s treatment of the Rohingya? We do not allow the word Rohingya. They are Bengalis. These people are not our ethnics. They are not our nationalities. They are from Bangladesh. Would like to see the remaining U.S. sanctions lifted? Yes, it would be a good thing to lift the sanctions. I would like to go back to talking about Section 436 of your constitution, which says that in order to amend it, you need 75 percent of the parliament. The military has 25 percent of the votes, [which gives it] a blocking veto over any changes to the constitution. So after the large vote for the NLD, would you change this article to make it easier to amend the constitution? We—the armed forces—favor national politics, not partisan politics. We are not rigid on the constitution. … We have already signed a nationwide cease-fire agreement. But we need a mature and stable political situation in our country. We need to gradually change. Right now we are not ready. What would you need to make you feel comfortable to turn more power over to the civilians? It would depend on the stability of our country and people understanding the practice of democracy. Some countries have faced problems as they become democracies. Are you referring to the Middle East and Arab Spring? The Middle Eastern countries are the worst example. We have only experienced democracy for a short time. To get good results for our country, you need to be patient. It is very difficult for us to have quick change in our country. Were you impressed by the way people turned out and voted on election day? I think the current government cannot fulfill people’s desires. Now that people have selected a person who they think can fulfill their needs, the next thing is for the elected person to fulfill their desires. When you talk to Aung San Suu Kyi, will you want to make sure you get amnesty for your troops? Of course you were not responsible for what happened years ago, but do you feel any regret for the pain and suffering that the military inflicted upon Aung San Suu Kyi and other NLD leaders? I was not responsible for that situation. It was because of the previous political situation. What are your red lines when it comes to negotiating with the new government? What are things you won’t budge on? I am prepared to talk and answer and discuss. No limits. She can have any topics, and I will answer. But if she asks you to change Article 59F, what will you say? I will explain my opinion to her. Can you assure the international community that there will not be any military interference with the results of the election? Our election was free and fair. The president already agreed to the transition of government. This is the right thing, and we [plan to] follow our president.